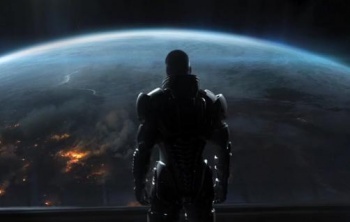 BioWare has released early details on the highly anticipated Mass Effect 3. Mass Effect 3's first trailer put Earth in a seriously bad spot, but didn't reveal much about gameplay. Just like the Reapers, first details have arrived on our doorstep. Sadly, they're secondhand, so take them with a grain of salt to an extent. A GameFAQs poster that got his hands on the latest issue of Game Informer reveals that BioWare is going with a middle ground between the RPG element levels of Mass Effect and Mass Effect 2. Mass Effect was criticized for delving too far into the RPG zone, while Mass Effect 2 took a similar amount of heat for focusing on shooter elements. Storywise, Mass Effect 3 will begin on Earth with Commander Shepard on trial. In its midst, Reapers invade the planet. Mass Effect 3's prologue follows Shepard's escape to the Normandy so he can gather his allies to take the Reapers down again. Some of these allies may include Liara, Ashley/Kaidan, Garrus, Wrex, Mordin, and Legion (if they're alive). One of the new squadmates/characters is named James Sanders, but the article doesn't seem to reveal what his deal is. The manipulative Illusive Man of Mass Effect 2 will also return, but his opinion of Shepard has changed. Cerberus, the Illusive Man's "humanity first" organization, is trying to kill Shepard in Mass Effect 3 for an unknown reason. Mass Effect 3 will again feature multiple endings depending on player choices and squadmates. What it apparently won't feature is multiplayer, a strongly rumored addition that the article rules out. In the BioWare forums, marketing manager Jarrett Lee stated that the company is largely trying to avoid spoiling the game beforehand this time. "Selling [Mass Effect 3] as awesome only by talking about basic game features can be difficult, but we may see a move towards that at this time," he wrote. No matter what we may hear, Mass Effect 3 could hold more secrets under the hood. Mass Effect 3 is scheduled for release by the end of 2011 on the PlayStation 3, Xbox 360, and PC.